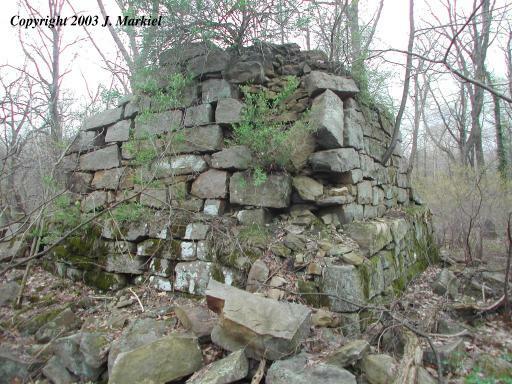 Washington Furnace (Westmoreland County) is crumbling to ruins in the woods. Ironically, the most complete element of the furnace is the cupola, which is almost always removed or destroyed at most furnace sites. Due to the potential instability of the furnace ruins, I did not climb to the top to see if the cupola was clear. As can be seen by the photographs, the rear and left hand side of the furnace remain in some standing condition, but the front and right hand side have fallen in. Trees and associated brush are slowly destroying the stack. 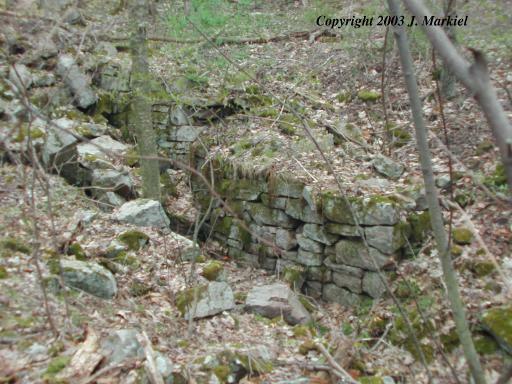 To the front of the furnace, along the right hand side, there is a mill race leading to the creek. This was probably the source of power for a wheel and bellows system. I found large slag piles to the front of the furnace, including the chunks from several large salamandars. I retained an artifact containing large chunks of unburnt charcoal and wood. Built By: Johnson, McClurg, & Co. 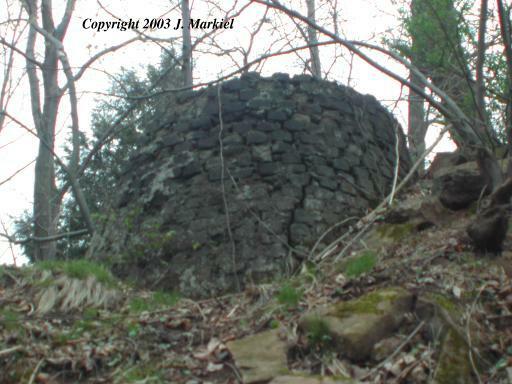 The furnace was built in 1809 and abandoned in 1826. In 1848 it was rebuilt by John Bell, who operated the site until 1854. Take PA 30 to Laughlintown, heading east. Just outside of town there will be a truck runaway ramp (heading west). 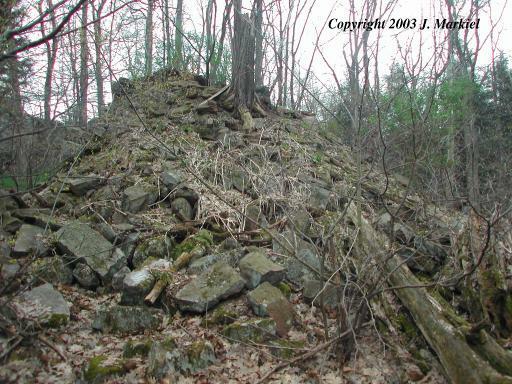 About 0.2 miles east of the runaway ramp, there is a private road to the left, marked with two stone pillars. Take the road down to the first bridge. The house the left just before the bridge owns the land the furnace sits on. After obtaining permission from the owner, cross the river behind the barn and then follow the natural stone wall to the left. The furnace is a few hundred yards down.